In recent years, it has become apparent that many people with type 2 diabetes are able to reverse type 2 diabetes (i.e. put it into remission) through methods including low-carb diets, very-low-calorie diets and exercise. Ineffective use of insulin results in the body becoming resistant to insulin - also known as insulin resistance, which in turn causes blood sugar levels to rise (hyperglycemia). In advanced stages, type 2 diabetes may cause damage to insulin producing cells in the pancreas, leading to insufficient insulin production for your body's needs. Type 2 diabetes has become one of the biggest long term health conditions in the UK and the world. Over 2 million people in the UK have type 2 diabetes. The symptoms of type 2 can come on very slowly and often the signs can be dismissed as simply getting old. The sooner diabetes can be diagnosed the better as damage can sometimes be done to the body by diabetes before it is diagnosed. With type 2 diabetes being so common we can all do with knowing the risk factors and symptoms. The common risk factors are body size: being overweight and particularly if you’re carrying extra weight round your middle. 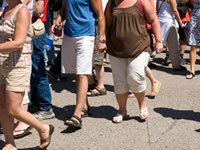 Age: people’s risk of type 2 diabetes goes up with age. Having a close family member such as a parent or sibling with type 2 diabetes. Remember symptoms can come on very gradually. Don’t be tempted to think that if you’ve had these symptoms for a long time that they must be normal. Type 2 diabetes may either be diagnosed by a urine test or a blood test. If these methods are not clear cut, you may be asked to take an oral glucose tolerance test. When you’re diagnosed with diabetes you will most likely need to make some changes to your lifestyle. Cut down on smoking and drinking. Take more physical activity - preferably each day. Eat a healthy, balanced diet - which you may find needs to be lower in carbohydrate than you might be used to. Is there an age where I'm more at risk of type 2? Some people with type 2 diabetes, usually those who have had type 2 diabetes for a number of years, may also be moved onto insulin injections. Maintaining good control of blood glucose levels, as well as blood pressure and cholesterol levels, is vital in reducing the risk of diabetic complications. If you are overweight, weight loss can often help to lessen the extent of diabetes symptoms. Like type 1 diabetes, type 2 diabetes carries the risk of diabetes complications over time. In fact, by the time they are diagnosed, 50% of people with type 2 diabetes show early signs of these health conditions. The list of complications, which also includes depression and sexual dysfunction, is not pleasant but their risks can be reduced through good diabetes control and attending all diabetic screening appointments. As with many chronic diseases, early diagnosis of type 2 diabetes is beneficial for treatment. Before type 2 diabetes develops, most patients exhibit pre-diabetic symptoms, and if treatment commences at this stage, diabetes of this type can be preventable. In terms of short term complications of diabetes, ketoacidosis is rare amongst type 2 diabetics. However, non-ketonic hyperglycemia is one threat type 2 diabetics should be aware of. As stated above, type 2 diabetes can lead to a greater chance of health problems which could in some cases affect your ability to work and could therefore affect your personal income. Another factor to bear in mind is that increased care may be needed, from your family or from a carer, particularly as you get older. With the right support and good diabetes management, the potential negative effects of type 2 diabetes can be minimised. Type 2 diabetes is already one of the most common long term health conditions and the prevalence of type 2 diabetes in the UK is growing year on year. The cost of treating a growing number of people with type 2 diabetes, and the health complications associated with the condition, is estimated to cost the NHS around £12 billion a year on direct and indirect care. According to the International Diabetes Federation (IDF), more than 371 million people across the globe have diabetes and this figure is predicted to rise to over 550 million by 2030. Of the total global diabetes rate, 90% are living with type 2 diabetes but it is estimated that up to half of these people are unaware of their condition (undiagnosed diabetes). In the UK, more than 2.7 million people are diagnosed with type 2 diabetes whilst a further 750,000 people are believed to have the symptoms but are yet to be diagnosed with the disease.